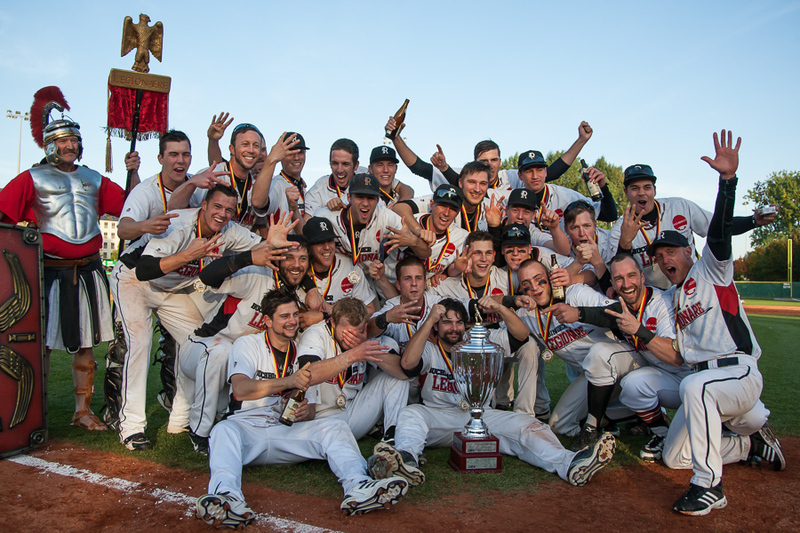 The Buchbinder Legionaere Regensburg have won a fourth consecutive championship in the German Baseball-Bundesliga. It is their fifth title in team history. The team of head coach Martin Helmig, who now has won 11 German titles, defeated the Solingen Alligators 9-7 in a thrilling game five of the best-of-five final series. 3,000 fans in a sold-out Armin-Wolf-Arena in Regensburg saw the Buchbinder Legionaere erase a 1-5 deficit in the process, clinching the pennant with a four-run eighth. Solingen actually had the better start into the contest. Home runs by Kai Gronauer (his fourth in seven playoff games for the Alligators) and Dominik Wulf in the third gave them the 3-0 lead. Regensburg got on the board in the bottom of the frame thanks to Chris Zirzlmeier’s run on a series of sacrifice bunts. The Alligators added two more runs in the top of the sixth thanks to hits of Tanner Leighton and Travis Bass. They looked poised to end the Legionaere-run at the top of German baseball, also behind a strong performance of left-hander Andre Hughes. However the southpaw ran out of gas shortly afterwards. The Buchbinder Legionaere opened the bottom of the sixth with three consecutive singles with Philipp Howard crossing the plate for their second run. A couple of batters later Enzo Muschik came through with two outs and the bases loaded to make it 3-5. While Solingen got out of the frame without further damage, the Regensburg offense now was full awake. They tied the game in the seventh. Matt Vance and Philipp Howard opened the frame with a walk and a double to put two runners into scoring position. Ludwig Glaser’s groundout plated Vance. Chris Howard’s two-out double evened the game. The Alligators tried to answer against reliever Daniel Thieben. The Minor Leaguer of the Seattle Mariners once again had control problems for the Buchbinder Legionaere. Solingen took advantage and loaded the bases with two outs. Jonathan Eisenhuth came in and forced Dominik Wulf into a fly ball to shallow center field. Shortstop Vance made a spectacular sliding catch to keep the score intact at 5-5. In the bottom of the frame Regensburg decided the outcome. Muschik set the tone with a leadoff double, chasing Hughes from the game. A couple of bunts by Maik Ehmcke and Vance, as well as an intentional base on balls for Richard Klijn moved two runners to second and third. With two outs Philipp Howard tried to bunt a 0-1 pitch for a base-hit, but the ball rolled over the foul line. He sent the next offering by reliever Sebastian Bernards over the head of left fielder Sascha Steffens to the warning track for a two-out, two-run ground-rule double. One moment later Glaser connected on a 3-0 pitch for a two-run home run and a 9-5 lead. This was the ballgame. Solingen was not yet done and tried to rally in the ninth. Singles by Moritz Buttgereit and pinch hitter Nick Renault sandwiched a Florian Goetze strikeout to lead off the inning. After a fly out by Julian Steinberg, Leighton stayed alive in a tough at-bat and put the ball into right-field for a two-run single. However Eisenhuth recovered by inducing Markus Stryczek into a fielder’s choice at short for the final out of the game. During the medal ceremony Matt Vance got named Most Valuable Player of the final series, his teammate Justin Kuehn best pitcher and Dominik Wulf best batter. For Wulf it probably was his last game in the German Baseball-Bundesliga. One of the best players in German baseball of the last decade announced prior to the season that he will retire at the end of the year. Overall more then 7,000 people saw the five games in attendance. Additionally all five were broadcasted live by Legionaere TV (all games available as video on demand), game five with eight cameras.